The past 2 years have been quite eventful, what with the arrival of twins and the shock of parenthood - complete some post-graduate study too you say…. Why not? I thought I’d write a short reflection on my experiences of studying for a Masters in Research in Creative Practices (MRes) at The Glasgow School of Art. My reasons for doing so are mostly self centred, a finishing off/rounding up of my experience but also as a way of orienting myself and my practice for the future. Perhaps they’ll be of interest to some of you out there wanting to undertake post-graduate study and looking for something other than a practice based Masters Degree. 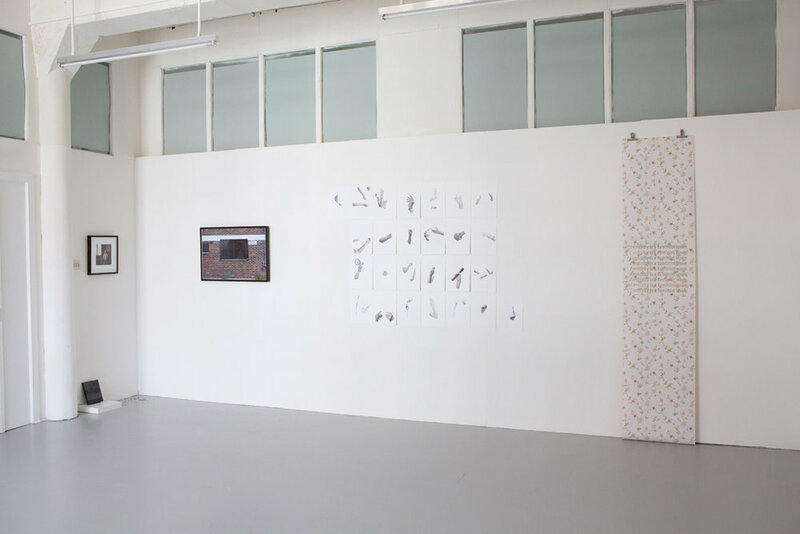 “ The Master of Research At Glasgow School of Art invites students to critically examine their academic and creative practices, within the context of social, historical, cultural and theoretical discourse. An interdisciplinary environment creates a new space for imaginative potential and connections.” (Group Show, 2017). I leave this course with a better understanding of the different contexts in which artists make work and the myriad of ways in which they can position themselves in relation to the work they create. I wouldn’t say I understand everything that has been presented or held up as artistic practice, nor do I lean towards an overly theoretical understanding of art and it’s power to communicate. Instinctual yet not un-intellectual, too much theorising leaves me feeling cold and switched off - not what art is supposed to do. Instead what I leave this experience with is a greater developed understanding of how to get from A to B, in terms of conceptualising a project, selecting appropriate research methods and making sure it is rigorous and ethical in its' overall design. For me this course was the right balance between practice and theory. Instead of going out and shooting more work and falling into old patterns, I stood back from the work I’d already created around housing and interrogated it in new ways; incorporating sound, text, print and photography. Definitions of what a photographer/photography is/could be had long left me feeling frustrated, I didn’t especially identify with being an artist not coming from a fine art background, yet this course provided me with the freedom of being able to contemplate creating work in new ways alongside others who were wanting to start similar conversations. The research I produced informs and under pins an ongoing body of work, which looks at housing inequality and the disproportionate impact of austerity cuts on women, something that I’ll continue to explore here in Glasgow. For the final project I interviewed women about their experience of living in areas of social housing in London which are currently under threat of demolition and re-development. With the support of an engaged supervisor who was genrous with time, I was able to produce written work of which I am proud (I chose a 100% written submission but you can also do a portfolio/dissertation option). I was also able to meet with members of Sisters Uncut during their occupation of Holloway Women’s Prison, which also helped shape the approach of the work in terms of understanding contemporary approaches to feminism. Some practical work was made along side the written research, some of which is posted here. These are less the finished article and more questions or responses to ideas which I’ll further explore. I re-used photographs taken on marches and rallies protesting the Housing Bill (2016), de-contextualising the hands of women, so they become symbols of women’s resistance and frustrations. Last week I attended a doctoral studies information event at GSA with a view to studying for a practice based PhD. I’m not sure if this is the right path for me right now, although it’s a privilege to consider it an option (subject to funding/being offered a place). The lack of social housing and the impact of austerity is undoubtedly an important area worth shouting about, but right now I’m thinking what’s stopping me from cracking on and making the work anyway… more practice, less theory…. it’s just a question of getting some sort of balance. Aysen Dennis, Housing activist, campaigner and resident of The Aylesbury Estate, 'Fantastic New Community' Zine, 2016. Blog for all things that inform and inspire my photographic work. Exchanges: Dialogues, Hesitation & Creation - Now on at the Harbourfront Centre, Toronto, featuring the work of: Ida Arentoft, Hannah Laycock, Jennifer Long, Gina Lundy, Sarah Mangialardo, Margaret Mitchell, Clare Samuel, Kate Schneider, Arpita Shah, and Stacey Tyrell. 20/20 Visions - Re-valuing Photography, People and Place. New work commissioned as part of the 20 year anniversary celebration of Knowle West Media Centre. 20 photographers commissioned to create work on re-valuing photography, people and place. Exhibition on until early 2017. The projects explores the current housing crisis in London from the perspective of those residents in areas undergoing significant re-development or total demolition - Sweets Way, Carpenter's Road, The Aylesbury, Cressingham Gardens and West Hendon. The title of the work is taken from an advertising slogan used by developers in Stratford, bordering the Olympic site in 2012. It is used in this context to question what is happening to the existing community in areas undergoing re-generation/re-development.